Available Colors: Royal Blue/White, Red/Black, White/Black, Lime Green/Gray, Orange/Gray or Solid Black. Imprint Area: Standard Large Panel: 10" W x 5-1/2" H Optional Small Panel: 6" W x 6" H, Standard Imprint Area is the Large Panel. Optional Imprint Area is the Small Panel. Imprint on Standard Location Unless Otherwise Specified on Order. Multi-Colored Imprint: Add $2.00/each for each additional color. Shipping Weight: 20 per carton @ 35 lbs. Customized 60" Arc Square Umbrella Item #HT-4034 (Minimum Order: 25). 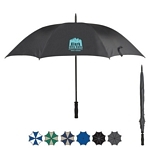 Promotional Umbrellas like the 60" Arc Square Umbrella can be personalized with your business logo and with No Setup Fees. Customized 46" Arc Edge Two-Tone Umbrella Item #HT-4036 (Minimum Order: 25). 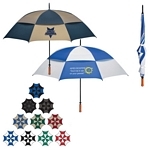 Promotional Umbrellas like the 46" Arc Edge Two-Tone Umbrella can be personalized with your business logo and with No Setup Fees. 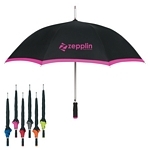 Customized 46" Arc Spectrum Umbrella Item #HT-4037 (Minimum Order: 25). 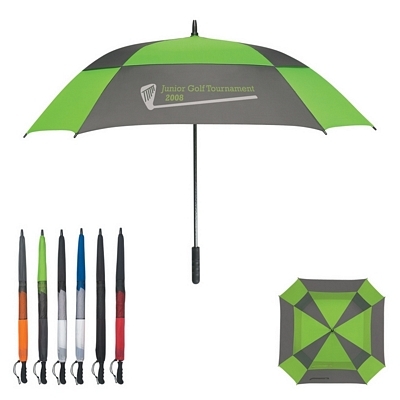 Promotional Umbrellas like the 46" Arc Spectrum Umbrella can be personalized with your business logo and with No Setup Fees. 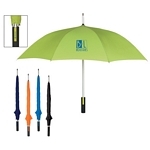 Customized 60" Arc Ultra Lightweight Umbrella Item #HT-4038 (Minimum Order: 25). Promotional Umbrellas like the 60" Arc Ultra Lightweight Umbrella can be personalized with your business logo and with No Setup Fees. Customized 68" Arc Vented, Windproof Umbrella Item #HT-4039 (Minimum Order: 25). Promotional Umbrellas like the 68" Arc Vented, Windproof Umbrella can be personalized with your business logo and with No Setup Fees.